Much to our delight, our blog was chosen as a winner of the Foodista Best of Food Blogs Cookbook contest, which "celebrates the best food bloggers worldwide." Our recipe The Color Purple Yam Dessert is among the winners to be published in a full-color book, Foodista Best of Food Blogs Cookbook set for release mid-October. 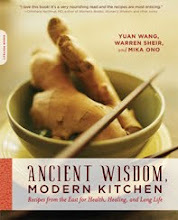 For many more of our recipes, look to Ancient Wisdom, Modern Kitchen: Recipes from the East for Health Healing, and Long Life (Da Capo Lifelong Books).